On this week’s episode of the Really Awful Movies Podcast, a look at the Oregon regional horror, Unhinged. Undoubtedly one of the more obscure films to end up on the Video Nasties list, Unhinged (1982) is a really solid, very low-budget effort from the Pacific Northwest. Three college co-eds are on a road trip through the back country, when a dispatch comes on the radio about…traffic problems ahead, and offering a detailed alternate route as a time saver. Just kidding. It’s an announcement about, what else? An escaped lunatic. If you don’t love that right off the bat, you have no heart. A sudden downpour occurs, and the girls’ little vehicle spins into a ditch (rather unconvincingly, it should be said, but hey…what do you want for $100K?). They awake, and are being tended two by a spinster Olive Oyl-like figure, her domineering mother, and a caretaker with a ridiculous mustache. So..will the girls be held in the remote mansion against their will, tormented by this creep-triumvirate? Will they be tied to the bed like Procrustes did his victims? Will there be some kind of Stephen King Misery set-up? Are you tired of an endless barrage of rhetorical questions? Unhinged is not your typical slasher film. There’s a lot more here than meets the Fulci eye (while not Italian, there are definitely some nods to that neck of the woods in these neck of the woods). Despite some akimbo acting, and some pacing issues, this is a film that’s not only oddly compelling, but also weirdly endearing. There are only a few scenes that would indicate this would be Video Nasty-bound, but overall it’s fairly tame and lets the story do the talking. With a fabulous synth soundtrack and a very memorable Barbara Bush-styled matriarch, you need to check out Unhinged (and please go and subscribe to the Really Awful Movies Podcast, where we tackle genre films of all stripes). Part artist, part huckster, William Castle is a name a lot of people know in the horror world. He produced Rosemary’s Baby (and would’ve directed too, were it not for health issues) but he’s best known for the gimmicks he deployed to promote the living heck out of his movies. 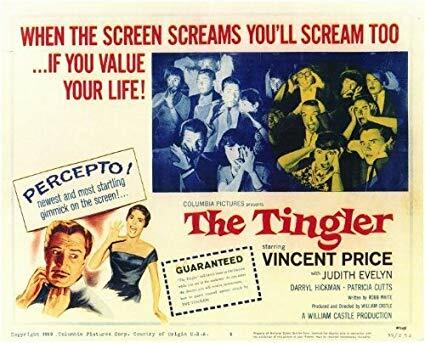 The Tingler, starring the legendary Vincent Price (check out our interview with his daughter, Victoria Price) is one such movie. Castle used “percepto” technology, a buzzer installed beneath some theater seats that literally shocked members of the audience! The cost of this equipment added $250,000 to the film’s budget, which was negligible by comparison. Percepto was used sparingly and in predominantly larger theaters for logistical reasons. The premise is delicious: Price stars as Dr. Chapin, a prison coroner responsible for doing autopsies on prisoners on death row (this seems like a waste of time and money, but that’s neither here nor there). A side of interest of his: how humans experience fear. He and a lab assistant speculate that there’s a structure on the spinal cord that is associated with fear responses (hence, “spine-tingling” fear). Dr. Chapin uses his wife as an unwitting participant, scaring her with a starter pistol and doing an examination on her spine. The Tingler is a fun movie, a corny monster movie / creature feature from the 1950s. And there’s the bonus of Castle himself introducing the film, and warning of the terrors to come. Hilarious! How do we experience fear? Are there different things people fear and how does horror exploit this?